How often have you stood in the flour aisle at the supermarket, at a loss to remember which kind you need for pizza dough...or waffles at the weekend? Wheat flour, cake flour or 00 flour? And let's be honest, there are certainly more exciting things to do than browsing through a pile of books on the subject of flour. But here's the good news: You don't have to! In our guide you'll find an overview of all types and varieties of flour and find out exactly what you can use them for. 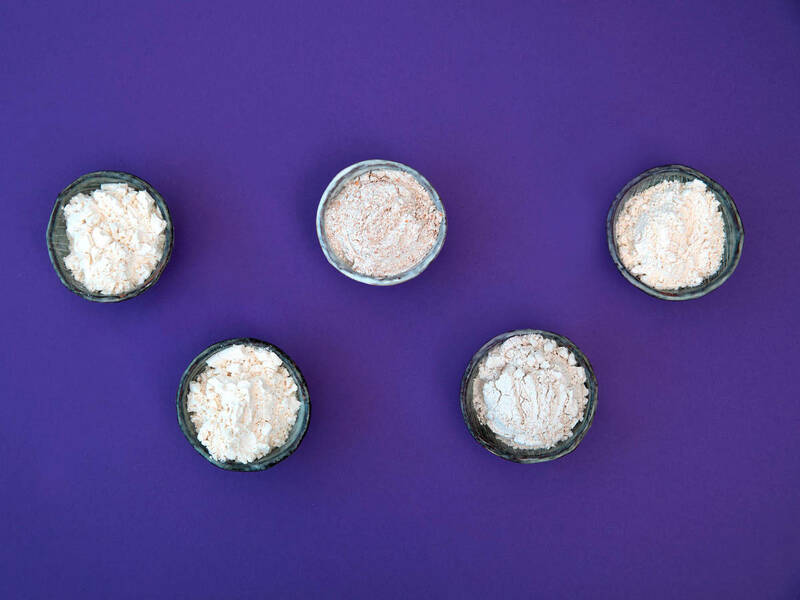 From all-purpose flour, wholewheat, to high-gluten flour–you've probably already come across different types of flour before and wondered how exactly they differ from each other. In short, how strongly the grain has been processed— or milled determines the mineral content of the flour and how it's classified. For example, the shells and seedlings of the cereal grains are sorted out to different extents, so that mainly the inner grain kernel is ground. The degree of grinding determines the mineral content of the flour—the more the grain is milled, the lower the nutrient content, since most of the minerals are found in the outer layer, or the bran, of the grain. Here's a quick rule of thumb: finely milled or 'soft' flours have less protein (aka gluten) and are better for light cakes and pastry, more coarsely milled flours are higher in gluten and produce more elastic doughs, leaving you with the elastic kinds of dough needed for bread. Now we know how the different types of flour are classified. Let's take a look at what they are used for. Cake or pastry flour: These classic baking flours are very finely milled, lending a very fine crumb to baked goods. Since these type of flour is made exclusively from the endosperm (the de-husked, wheat inner) it has a low protein content, about 6-8% for cake flour and 8-10% for pastry flour. The flour has a very fine consistency and is suitable for fine baked goods, cakes, tarts, cookies, sponge dough, short pastry, gingerbread, choux pastry, white bread, and for thickening sauces. All-purpose flour: This useful flour is just slightly coarser than cake or pastry flour and therefore has slightly more protein weighing in at about 10-12%. Its advantage: It absorbs liquids such as milk or water much more slowly, so the dough remains more stable during the baking process. All-purpose flour is used, for example, for white bread, pizza, puff pastry, yeast pastries, quark dough, sponge dough, short pastry, cookie dough, spaetzle, and dumplings. Bread flour: This flour has about 12-13% protein and ideal, as it's name suggests, for bread! However, its consistency is also coarser and is not suitable for all types of bakery products. However, it is suitable for dark wheat and light mixed breads as well as for savory pastries. Italian 00 flour: This super fine flour is 'the' Italian pizza flour and is also known as Manitoba flour. Thought it's very soft, it's protein content hovers between 8-12%, unsurprising when you consider those deliciously chewy pizza bases. If even the mere mention of pizza has your appetite spiking, take a look at our homemade pizza dough video right here! Wholewheat flour: In wholewheat flour, the entire grain, including the endosperm, wheat germ, and outer bran is ground, which is why its degree of grinding is a cool 100 %! This flour offers the highest possible proportion of valuable minerals and dietary fibres and is often used for rustic wholemeal breads. If one regards its content of mineral and ballast materials, rye flour is the winner. The popular flour type scores with a high portion of secondary plant materials, to which the grain owes its color and the tart flavor. White rye flour: Perfect for baking brown and rye bread. This type of flour is particularly popular among bakers, with a grinding ratio of 69 - 72 %, as bread with this flour develops a hearty flavor and a beautiful, light crust. Medium rye flour: With a degree of grinding of 75 - 78 %, this rye flour has an even stronger taste and is naturally darker than white rye flour. It is particularly suitable for strong rye breads and mixed breads. Rye flour: This flour has a degree of grinding of 79 - 83 % and is often used for rye breads and together with wheat flour for mixed breads. Just like whole rye flour, this flour type has a low glycemic index, which means that the blood sugar level rises more slowly. Did you know: Spelt is closely related to wheat and can be substituted for wheat flour. It has a slightly nutty taste and a comparatively high content of minerals and fibre. However, since spelt contains even more gluten than wheat, people who suffer from celiac disease or gluten intolerance should avoid spelt flour. White spelt flour: With a grinding ratio of up to 75%, this spelt flour is ideal for cakes, biscuits, sponge dough, short pastry, choux pastry, strudel dough, pancakes, yeast pastries, gingerbread, cookies, and white bread. Fine, medium, or coarse-grained flour? In terms of flour, you may have already come across the terms fine, medium, and coarse-grained. These basically describe nothing other than the how fine the flour is.. Fine flour, for example, refers to the fine cake or pastry flour, while medium-grained flours are coarser ground and have a higher swelling capacity, so they are ideal for making pasta or spaetzle yourself at home. Coarse-grained flour is characterised by its even coarser flour particles, which absorb the liquid slowly and evenly, ideal for the production of elastic doughs like bread. Buckwheat flour: This fairly dark flour scores highly with its nutty flavor and a comparatively high protein content. Buckwheat flour is great for hearty baked goods, bread, and also for cakes and waffles. Almond flour: A very aromatic flour alternative, which you should not confuse with ground almonds—for almond flour the nuts are ground as well, but then de-oiled. Almond flour can be used, for example, to bake sweet pastries, cakes, brownies and muffins, but is also great as breadcrumbs for meat and fish dishes. Coconut flour: The de-oiled, dried and ground flesh of the coconut is rich in protein and fibre but cannot replace wheat flour and co. one to one when baking. The following applies: one quarter of the regular flour used can be replaced by coconut flour. Coconut flour is also great for thickening soups, sauces, and desserts. Corn flour: Due to its low protein content, corn flour is only suitable for baking bread when mixed with wheat flour, for example. It is used to thicken soups and sauces and to make nachos, tortillas, and corn waffles. Chickpea flour: Nutty chickpea flour is also a very good vegetable protein source for vegetarians and vegans. It can be used in many different ways but is particularly suitable for pancakes or homemade falafel. Rice flour: A wonderful alternative that you can use for both sweet and savory baked goods. Try rice flour in cakes, cookies, and muffins or for traditional Indian dosa! Manioc flour: Also known as tapioca flour, this flour is obtained from manioc roots. It is very versatile, as it is almost tasteless, and can be mixed with a little water to make an excellent binding agent. In American recipes, the ingredients are usually expressed in cups, while in European countries the grams are more common. If you need to convert the units for one of your next baking experiments, this overview will help you to measure the flour correctly. The question of all questions: How long can flour be kept? Contrary to many assumptions, flour can very well go bad, depending on the fat content of the flour. Finely ground flours, such as cake or pastry flour or white rye flour, last longer and can be stored in a cool and dry place for a very long time. More coarsely ground flours such as wholemeal flours, on the other hand, can become rancid after only 4 to 6 weeks. It's best to store your flour in a light, airtight container and protect it from extreme heat or cold, a room temperature of 16°C to 20°C is ideal. Which flour do you use most often for baking cakes, bread or pizza? Do you have a favorite recipe that you would like to share with us? Then tell us in a comment or send your recipe to community@kitchenstories.com.